The college had received an £817,000 grant from the Football Foundation to develop a range of sports facilities, including the 3G surface where the launch took place. 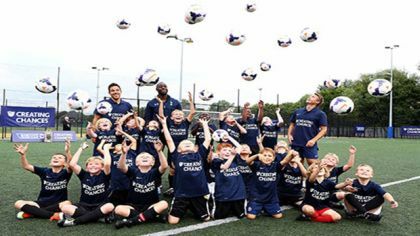 The facilities were showcased during the launch live on Sky Sports News and included a match between Manchester United’s and Tottenham Hotspur’s Under-18 Premier League Kickz teams, and training sessions for the local kids held by former Spurs defenderLedley King and Football Foundation Ambassador, Graeme Le Saux. The Foundation funding,awarded to Bacon's College in 2005, has provided a wide range of new facilities for the local community, including two junior football pitches, an artificial cricket wicket and practice nets, as well as changing rooms and CCTV cameras. This resulted in a 700% increase in the number of local football participants since the facilities were built, with the number of individual users rising from 1,086 to 7,265.